Mr Fox: This is going to be a total cluster-cuss for everybody. Let me just get this out of the way; Wes Anderson’s FANTASTIC MR. FOX is certainly aptly titled as the perfect word to describe it is simply, fantastic. This stop-motion Roald Dahl adaptation about man versus animal honours its roots and broadens its ideas into a contemporary family classic that is both insightful and yet still playful. In his first foray into animation, Anderson does not bend to the style but rather turns the style itself inside out to become the perfect compliment to his quirky and expressive nature. Despite being fantastic, Mr. Fox (voiced by a spry George Clooney), has gotten himself and his neighbours into a hole they can’t get out of. After promising his wife, Mrs. Fox (a sly Meryl Streep), that he will never steal again once she announces that she is pregnant, Mr. Fox deliberately breaks that promise and angers the biggest farmers in town, Boggis, Bunce and Bean. The farmers drive the animals underground and they must come together to dig their way out. The battle is on and the delight with which Anderson seems to be having with it all, draws the viewer as deep into the depths of the film as the tunnels being dug on the screen. While Anderson, along with THE SQUID AND THE WHALE writer, Noah Baumbach, infuse the screenplay with adult themes a plenty, from resisting your natural instincts to rising above the hand that feeds you, they create a pace that is delicate and quiet but never so much so that younger viewers will lose interest. Under Anderson’s always mindful and always expansive eye, FANTASTIC MR. FOX is as cunning and as sharp as one would expect a fox to be. It is its unexpected charm though that will make it Anderson’s most endearing work. 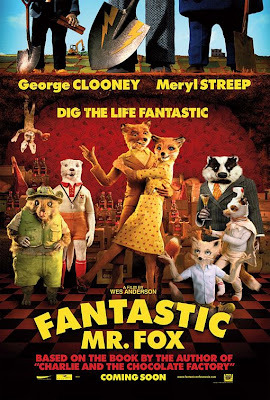 How many sheep would you give Fantastic Mr. Fox? The aesthetics of this new Fantastic Mr Fox are inspired, but they do the story a disservice by creating a new plot that isn’t nearly as good as the original.